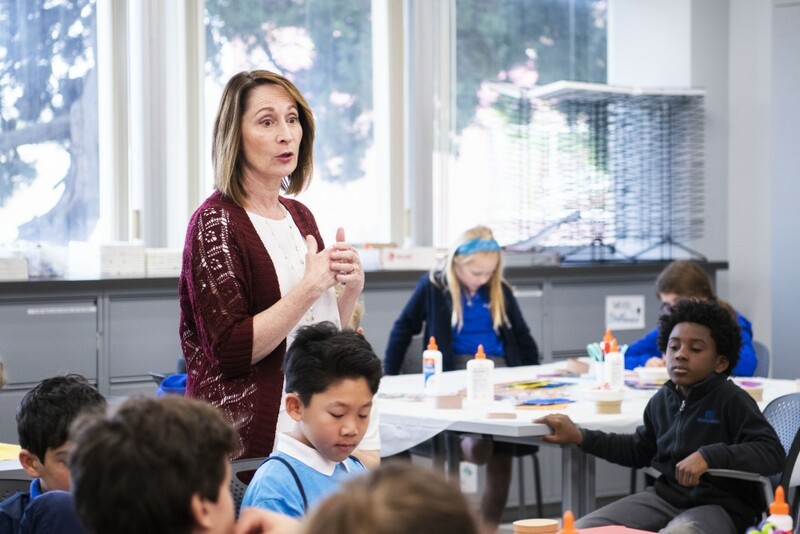 Harness the collective imagination of nearly 50 kids, channel it through their art and technology teachers, add a Hollywood production designer’s know-how and unleash it all on a blank canvas inside a new USC research laboratory. What do you get? An interactive wall mural that’s far from your stereotypical enchanted forest — rainbow-maned, purple-horned unicorn and all. On Mar. 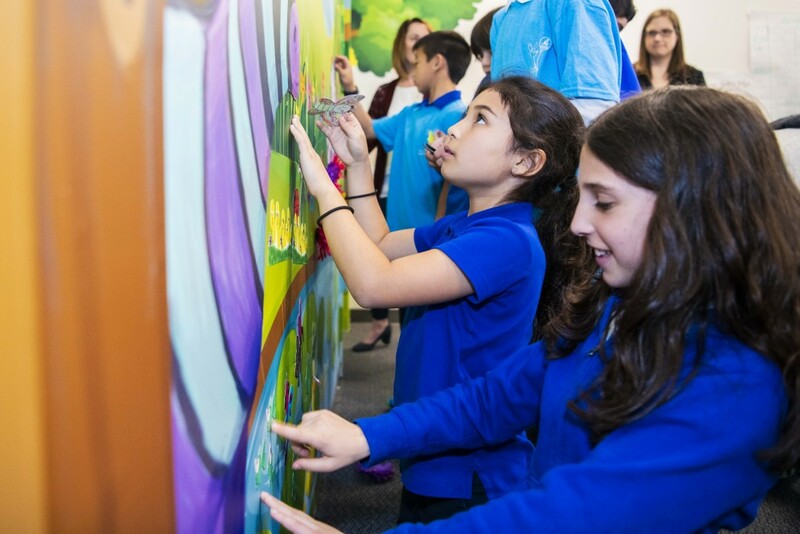 21, an entourage led by 8-, 9- and 10-year-old students from the Mirman School visited the USC Chan Division of Occupational Science and Occupational Therapy to see firsthand the graphic wall mural they designed throughout the past year. Located on Mulholland Drive in Los Angeles, Mirman School is an independent school for gifted children ages 5–14. Plans for the mural were put in motion last year when USC Chan Associate Dean and Chair Grace Baranek contacted Kristan Andrews, a film and television production designer and the parent of a Mirman School student. “When Dr. Baranek approached me about creating a mural for her children’s neuroscience laboratory, I thought it might be fun to involve the kids at Mirman,” Andrews said. Baranek is the director of the Innovations in Neurodevelopmental Sensory Processing Research laboratory — affectionately known as the “insp!re” lab — located on USC’s Health Sciences Campus. Comprised of a multidisciplinary team of experts, the insp!re lab focuses on advancing knowledge and raising awareness of early risk signs of autism spectrum disorder (ASD) and other childhood neurodevelopmental disorders. With students taking the creative lead in 2018, Mirman School art teacher Patter Hellstrom and assistant art teacher Giovanni Zelaya guided them as they used Photoshop to digitally build elements of what would become the enchanted forest mural. “We chose the theme, and the theme really provided a great springboard for imaginative drawing and thinking and color-combinations, along with interactive pieces,” Hellstrom said. The scope of the project expanded as the students learned more about the needs of the mural’s target audience: future research participants including children with ASD and their families. Although not formally a component of any current study designs, the mural isn’t simply waiting room décor. By accommodating the interests and experiences of young children, it affords far more naturalistic interactions than a sterile university research environment. 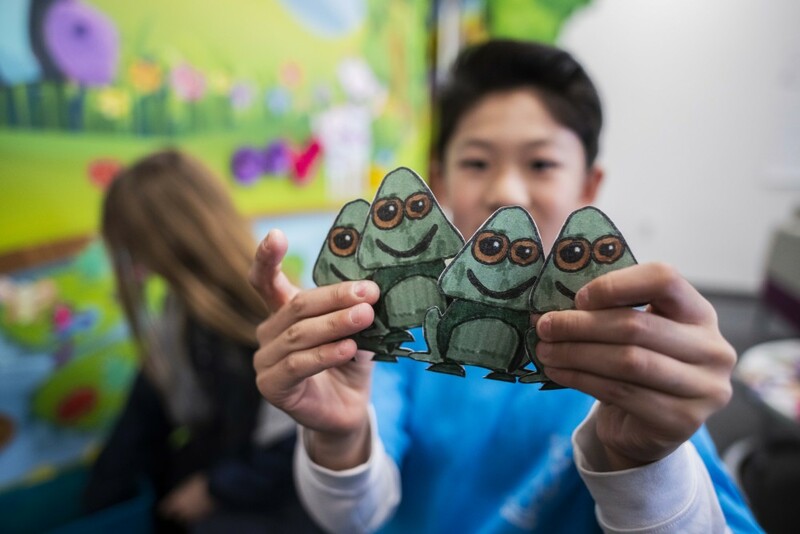 For example, custom plush toys and magnetic creatures based on Mirman students’ artistic renderings offer visitors opportunities for tactile exploration and social interaction. The lab’s research focuses on developing and refining pediatric screening tools for use in community settings, which can help parents and caregivers flag behavioral concerns potentially tied to ASD, such as differences in sensory reactivity and social communication. Feasible screening tools can lead to earlier identification and follow-up with health care professionals, including occupational therapists. The team is also designing interventions delivered by caregivers to promote infant and toddler development in social-communication, sensory regulation and daily living skills. At USC, Baranek spoke with the students about occupational therapy, autism and the lab’s research objectives. Many chimed in to share personal perspectives. In between doing a collage craft activity and taking sips from their juice pouches, the Mirman students got to tour the insp!re lab to see their own artistic ideas brought to life on the mural. “They made so many copies of my frog!,” one student shouted. 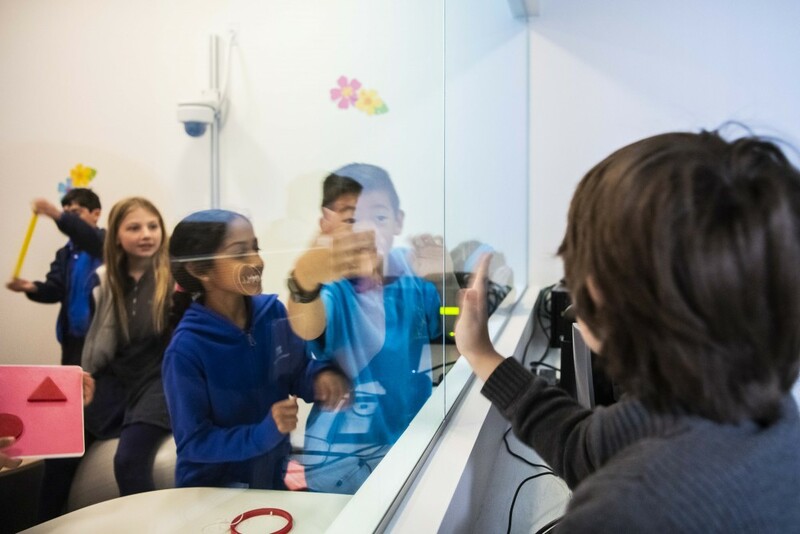 Students also got to see the lab’s “secret room” — an adjacent suite made “secret” by a one-way mirror for confidentially observing and recording research participants. “I want to spy on my friends!,” laughed one student. Altogether, the Mirman field trip to USC Chan capped a uniquely collaborative experience, with students, teachers, artists and researchers together laughing, listening and learning about ASD.